Did someone mention Elvis? This research made the cover of ACS's Journal of Physical Chemistry in color. The diatomic cyanide ion CN− is released sometimes by the chemical compounds that contain the cyano group C≡N. 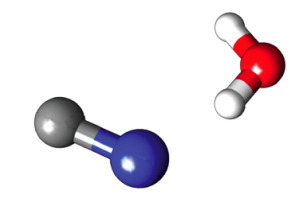 Figures 1 and 2 of the researchers show the subject of this paper, the barbell-shaped cyanide ion interacting with the boomerang-shaped water molecule in gas phase. Xue-Bin Wang and team reported the first gas phase spectroscopic studies ever on CN-(H2O)n clusters, where n=1 to 3. They presented in detail a joint experimental/theoretical study of the H-bonding structure and dynamics of CN-(H2O). Figure 1. Cyanide ion (C = blue&N= gray) and water (red = O&white = H) molecule. The team found that the molecules interacted differently at different temperatures. At room temperature, the barbell-shaped cyanide held steady while the water molecule rocked and flipped around the cyanide. At lower temperatures, however, the boomerang-shaped water held still while the cyanide tumbled at one of water's two hydrogen (H) atoms. Then cyanide flipped, pointing either its carbon (C) atom or its nitrogen (N), towards one hydrogen (H). At the lowest temperature tested, 12 K, the molecules froze, with cyanide pointing its nitrogen end at the water as you see in the middle position shown in Fig. 2, towards water's oxygen. "Water can interact with cyanide's carbon or nitrogen and rock back and forth on one atom," said Wang. "Scientists have known for years that atoms move around when temperature rises. Now they can determine the most probable position that the molecule is in at different temperatures." Figure 2. The water-cyanide potential energy landscape at room temperature. The red broken line represents the lowest energy path. Wang et al. accomplish in this paper at least the following. (1) Extensive theoretical analysis of the potential energy function of the cluster reveals the existence of two nearly isoenergetic isomers corresponding to H2O forming a H-bond with either the C or the N atom, respectively. (2) This results in four topologically distinct minima, i.e., CN−(HaOHb), CN−(HbOHa), NC−(HaOHb), and NC−(HbOHa). (3) There are two main pathways connecting these minima: (i) CN− tumbling relative to water and (ii) water rocking relative to CN−. (4) The relative magnitude of the barriers associated with these two motions reverses between low (pathway i is preferred) and high (pathway ii is preferred) temperatures. (5) The study (even in gas phase) provides an example of the interplay between temperature and the structures and dynamics of anionic aqueous clusters. (6) This study also underlines the importance of coupling state-of-the-art experiments with high level calculations for complex chemical phenomena. (1) Xue-Bin Wang, Jasper C. Werhahn, Lai-Sheng Wang, Karol Kowalski, Alfred Laubereau, and Sotiris S. Xantheas, Observation of a Remarkable Temperature Effect in the Hydrogen Bonding Structure and Dynamics of the CN-(H2O) Cluster, J. Phys. Chem. A, 2009, 113 (35), pp 9579–9584, DOI 10.1021/jp9034002. (2) News release on September 3, 2009 @pnl.gov.